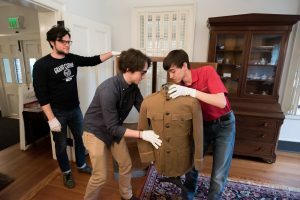 Students ready a uniform for display in the exhibit “William Gorgas and the Great War,” which opens March 4 at Gorgas House Museum. TUSCALOOSA, Ala. — A new exhibit at The University of Alabama’s Gorgas House Museum highlights the contributions made by William C. Gorgas during World War I. “William C. Gorgas and the Great War” will open Saturday, March 4, with a reception from 1 to 3 p.m. 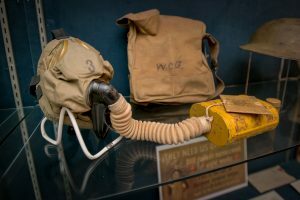 The exhibit includes original World War I uniforms and war paraphernalia, including Gorgas’ gas mask, canteen and other items. The exhibit highlights the contributions that Gorgas made in sanitation for the modern armed forces as well as his importance and role inspiring other Alabamians to serve their country. “This year marks the centennial anniversary of the United States’ entry into World War I and, as an important player and contributor to America’s success in World War I, the Gorgas House Museum seeks to honor William Gorgas’ lasting legacy,” said Lydia Ellington Joffray, museum director. “William Gorgas and the Great War” opens March 4 at the Gorgas House Museum. William Crawford Gorgas was the eldest son of UA’s eighth president, Josiah Gorgas, and Amelia Gorgas, UA’s librarian, postmistress and nurse matron. William was offered the presidency of the university in 1911. Although he would have loved being able to return to his home state, William declined to continue working in sanitation and medicine. The exhibit will be available to the public during regular museum tours from 9 a.m. to 4:30 p.m. Monday through Friday through Sept. 29. The museum will be closed over Spring Break (March 13-17). The exhibit is free for students, faculty/staff and Museum members. Cost is $2 for the general public. The opening reception is free and open to the public. The Gorgas House Museum also has sponsored a second exhibit in the Veteran and Military Affairs Office on the third floor of Houser Hall. “Lafayette, We Are Here! America Enters the First World War” highlights the University’s and the state’s contributions to the war effort.